From flashlights to electric vehicles, batteries provide power for many of the devices we use in our daily lives; the increasing demand for both high-powered electronic devices and renewable energy sources makes improving existing battery designs a critical priority for high tech industries across the board. American Element is committed to providing researchers and manufacturers with the advanced materials needed to meet the challenge of developing next-generation batteries that are safer, more efficient, energy-dense, and cost-effective for use in flexible electronics, medical devices, low- or zero-emission transportation, grid-level energy storage, and distributed power generation. All batteries are closed electrochemical cells that convert internally stored potential energy into electrical energy via the flow of ions between two oppositely-charged electrodes, separated by an electrolyte material that is both ionically conductive but electrically insulating. Connecting the terminals of a battery to a circuit causes an electrochemical redox reaction in which the surface of the negative electrode, or anode, is oxidized and the surface of the positive electrode, or cathode, is reduced. While charged ions can pass through the electrolyte freely, electrons must travel through the external circuit from the anode to the cathode, creating an direct-current voltage capable of doing work. This process is known as the battery’s discharge. For primary type batteries, commonly referred to as single-use or disposable, discharge is an irreversible process that continues until electrode and electrolyte materials can no longer react. For secondary or rechargeable batteries, applying an external current reverses the chemical reaction: as electrons enter via the anode, the electrode and electrolyte materials return to their pre-discharged state, allowing the battery to be charged and discharged multiple times. The life of a secondary battery depends on how well the reactants reconvert, less efficient models degrading over an extended span of charging and discharging cycles. Most current commercial battery designs employ electrodes in the form of metal rods, sheets, or plates combined with an electrolyte in the form of either a liquid (as an aqueous or non-aqueous solution), a semisolid paste, or a solid (particularly in advanced thin film solid-state batteries); some emerging designs incorporate liquid metal electrodes or advanced nanomaterials like graphene oxide. Primary and secondary batteries are manufactured in a wide range of shapes and sizes from micro-sized coins or buttons to large rectangular cells that power submarines. Other shapes include cylinders, prismatic cans, pouches, plates, and flexible thin films. Factors that influence the choice of battery shape are dependent on the intended application and include weight and size, cost of materials, and voltage requirements. A similar type of energy storage device is the supercapacitor (SC, or “supercap”), known alternatively as an ultracapacitor or an electric double-layer capacitor (EDLC). Traditional capacitors differ from batteries in that the energy must be first be externally supplied and stored only as a static charge; they take the form of two metallic electrode plates separated by an insulating but polarizable material known as a dielectric. Supercapacitors replace the dielectric with a liquid electrolyte, allowing them to store energy both electrostatically and electrochemically and thereby increase their capacitance; though their energy density is much lower conventional batteries, their power density is far greater, allowing them to be discharged and recharged much more rapidly. Supercapacitors differ from batteries in that the energy must be first be externally supplied rather than self-generated; for a given weight and size, they are capable of storing only 1/20th the amount of energy as a high-powered battery, but they can discharge and recharge nearly instantaneously. This ability lends several advantages: supercapacitors can generate quick, repeated bursts of power that batteries are unable to; their performance is less susceptible to fluctuations in ambient temperatures; and the ability to be fully discharged when not in use extends their lifespan and minimizes the dangers associated with transporting and shipping. As such, they are gaining importance in green energy applications such as electric vehicles, solar firming, and grid energy storage. Primary, single-use, or disposable batteries have a set lifespan that consists of a single discharge cycle that lasts until its internal components are irreversibly degraded by chemical reactions. While primary batteries cannot be recharged, they tend to resist deterioration during extended periods of nonuse. These widely commercially available batteries are lightweight with high energy density and shelf life, typically used as a portable or backup source of DC power. Primary cells are classified by the composition of their electrolyte materials. Zinc-Carbon: Also known as a “dry Leclanché cell.” The outer cylindrical zinc metal casing (or can) functions as the anode, while the cathode is composed of a graphitic carbon rod surrounded by a mix of manganese dioxide and graphite or carbon black powders; the electrolyte material is a semisolid, slightly acidic paste of ammonium chloride, sometimes with zinc chloride. Zinc-carbon batteries exhibit a sloping discharge and possess a moderate shelf life; invented in 1868, they remain popular low-cost, general purpose cells commonly used for lighting and small toys. Modifications to the zinc-carbon design led to the zinc chloride or "heavy duty" battery, which exhibits improved capacity and longer shelf life: the cell utilizes a high purity zinc alloy anode, a cathode with high purity manganese oxide in a lower proportion to carbon, and a larger volume of electrolyte solution that is composed of mainly zinc chloride and water. Magnesium-Carbon: A variation of zinc-carbon batteries that use magnesium or magnesium alloy instead of zinc for the can material. Developed for use in military radios and field equipment, these batteries have a longer shelf life and twice the capacity of equivalent-sized zinc carbon analogues, particularly in high temperature environments; however, they also experience a notable voltage drop when a load is initially applied to the cell, an unattractive feature for some applications. Alkaline: Popular general-purpose cylindrical or button-shaped cells for products such as flashlights, watches, and small consumer electronics. These cells take their name from the highly alkaline (as opposed to acidic) electrolyte solution of potassium hydroxide, which is also mixed with zinc powder in a gelled form to create the anode material. The cathode is a highly compacted mix of manganese dioxide and carbon, and both electrodes are typically separated from the electrolyte by a thin barrier or paper or fabric. The steel casing does not participate in the electrochemical reaction. Alkaline batteries have excellent shelf life, good low-temperature and high-rate performance, exhibit a sloping discharge (a gradual decline in voltage as a function of the depth of discharge), and are well-suited for high-drain applications. Zinc-Silver Oxide: Energy dense cells used in hearing aids, pacemakers, watches, and other applications, typically composed of flat, circular cathode of silver oxide with manganese dioxide and graphite, a homogenous gelled anode of amalgamated zinc powder, and an alkaline electrolyte solution of either potassium hydroxide or sodium hydroxide. Zinc-silver batteries are replacement for zinc-mercury oxide and cadmium-mercury oxide, which are declining in use and availability due due to health and safety concerns. Zinc-Air: The active cathode material in these button cells is atmospheric oxygen, which does not require the space normally dedicated to a solid cathode material; the design allows for a greater amount of anode active material while decreasing the overall size of the battery; as such, giving them the highest energy density of all commercially available primary batteries. The anode is amalgamated gelled zinc powder and potassium hydroxide electrolyte mixture encased in a triclad metal can with an innermost layer of copper followed by stainless steel and electrically conductive nickel. The cathode container is a separate nickel-plated steel can punched with holes to allow air to enter the cell and contains a screen coated with carbon and manganese dioxide to act as catalysts. Primary Lithium: Not to be confused with lithium-ion rechargeable batteries, disposable lithium batteries are notable for their high energy density and long shelf life. Anodes in these cells consist of metallic lithium or lithium compounds; a wide range of and electrolyte chemistries exist, the most common commercially available model pairing a lithium metal anode with a manganese dioxide cathode and a non-aqueous lithium electrolyte salt in what is known as a lithium-manganese dioxide (LiMnO2, or Li-Mn) battery. 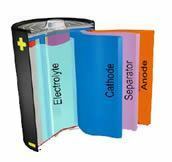 Both the cathodes and electrolytes in other lithium batteries designs can be either liquid or solid in form. Liquid cathode models like lithium-thionyl chloride (Li-SOCl2) and lithium-sulfur dioxide typically offer higher discharge rates and perform well in low temperatures but also exhibit an initial voltage drop, limiting their use to high-drain applications. Lithium-iron disulfide (Li-Fe) cells are also known as “voltage compatible” and better-performing alternatives to standard alkalkine batteries. Lithium batteries that employ solid cathodes include lithium-carbon monofluoride (Li(CF)n), which has been shown to be highly efficient; solid electrolyte models like lithium-iodide perform best in low-voltages and have extremely long lifespans, making them useful for pacemakers and other implanted medical devices. Other cathode materials include copper oxide, lead bismuthate, bismuth oxide, and copper disulfide. Secondary batteries have the ability to reverse the flow of charge; when a voltage is applied, the chemical reactions that occur during discharge reverse, restoring the electrodes and electrolytes to their pre-discharge chemistries. 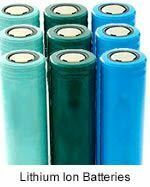 Nickel Cadmium (Ni-Cd) batteries are composed of a nickel oxide hydroxide cathode, cadmium metal anode, and an alkaline electrolyte solution containing potassium hydroxide. These batteries are notable for their ability to discharge rapidly at nearly full capacity and have exceptional lifespan, an asset utilized by satellites and aircraft backup systems; however, they are high susceptibility to memory effect. Though at one point they were one of the most popular consumer rechargeable batteries for small electronic devices, Ni-Cd technology is declining in use due to the relative cost of materials and capacity compared to nickel-metal hydride batteries, and environmental concerns about the toxicity of cadmium. Nickel Metal-Hydride (NiMH, or Ni/MH) batteries utilize a mix of solid metal hydride compounds, typically containing rare earth metals (lanthanum, cerium, neodymium, and praseodymium) along with nickel, cobalt, aluminum, or manganese. NiMH batteries have a high energy density and good resistance to corrosion, a flat discharge rate and ability to deep cycle NiMH batteries have twice the energy density and twice the energy per unit volume as NiCd batteries, in addition to being less and environmentally hazardous and less expensive to produce, in addition to being recyclable. Larger models have applications in traditional backup power and grid energy storage; early hybrid vehicle models used NiMH batteries before being supplanted by lithium ion technologies. 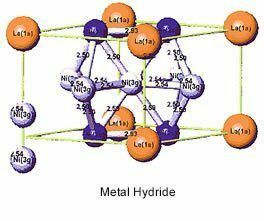 Nickel-Hydrogen batteries store hydrogen in the form of a gas rather than the solid metal hydrides of NiMH cells. These batteries have a higher energy density and energy per volume than Ni-Cd but half as much energy per unit volume of NiMH, in addition to being expensive to produce. They store hydrogen in the form of gas and have extremely long life cycles, a feature that has been advantageous in powering satellites and space telescopes. Lead Acid cells are the oldest type of rechargeable battery and are the most widely used in gasoline and diesel-powered automobiles, boats, and are the main type of battery used in photovoltaic (solar cell) power systems. Classic flooded lead acid (FLA) or wet cell design consists of two lead-based plates (lead oxide or alloys of lead with antimony or calcium) and a low-concentration sulfuric acid electrolyte that generate power through the formation of lead-sulfur-oxide and the increase in pH of the electrolyte solution. This process consumes water and releases hydrogen gas as a byproduct, necessitating venting and periodic replacement of the water. Flooded lead acid cells have the ability to deep cycle. Alternatives to flooded cells are valve-regulated lead acid cells, or VRLA, sealed cells that trapping the hydrogen gas near the plate that can then be recombined when battery is charged, eliminating the need for venting and the risk of spillage. VRLA options include gel cells, which use a gelified electrolyte mixed with fumed silica, and absorbed glass mat (AGM) cells, which use a fiberglass mat saturated with a sulfuric acid electrolyte. Lithium Ion: High energy density lithium-ion (Li-I) batteries are the current hi-tech standard in the computing and electronics. The central mechanism by which the battery stores and generates energy is the reversible intercalation, or insertion, of lithium ions in the crystalline electrode materials; the positively-charged Li+ ions shuttling between the cathode (typically a lithium compound or mixed metal oxide) and the anode (typically graphitic carbon) through the electrolyte and separator membrane. Because of the high reactivity of lithium metal with water, non-aqueous electrolyte formulations are required, typically lithium salts like LiPF6 in an organic solvent. Types of Li-ion batteries are known by their cathode materials, the most common being lithium cobalt oxide (LCO), lithium manganese oxide (LMO), lithium iron phosphate (LFP), and lithium nickel manganese cobalt oxide (NMC). Two other chemistries that are gaining attention for transportation and grid energy storage applications are lithium nickel cobalt aluminum oxide (NCA), used as a cathode, and lithium titanate (LTO), used as an anode material replacing graphite. Commercially available lithium-ion batteries are typically cylindrical; pouch-type cells are a more recent architecture that can help reduce weight and use packaging materials more efficiently. Lithium polymer batteries (Li-P), also known as polymer electrolyte batteries, are a variation on the standard lithium-ion cell design which use a lithium cobalt oxide or a similar material as the cathode, metallic lithium or a lithium intercalation compound such as lithium-carbon as the anode, and vacuum-deposited thin film electrolyte layers composed of polymers. Most batteries take on a pouch shape, but lithium polymer batteries have the advantage of delivering comparable performance to lithium ion batteries while being able to take on irregular shapes that can be molded or extremely thin. These chemistries are commercially available and used to power a majority of the thin, flexible wearable electronics currently on the market; they are also under consideration for use in electric vehicles. Other designs under consideration employ a cathode composed of a polymer or a polymer in combination with organosulfur compounds. The current generation of lithium-ion batteries suffers from certain limitations to electrochemical performance that arise from its design, from the low conductivity of oxide-based cathode materials and insulating tendencies of electrolyte binders to the formation of dendrites at the surfaces of the electrode-electrolyte interface. Added to safety concerns based on the high reactivity of lithium metal, and the flammability and toxicity of electrolyte formulations, researchers are focusing on developing alternative designs that either improve existing lithium-ion technology or propose commercially viable alternative technologies. Some substitutes for electrode materials include lithium vanadium oxide, lithium vanadium phosphate. Alternative chemistries to the lithium-ion paradigm include lithium-sulfur, sodium sulfur, sodium ion, lithium-air, nickel-lithium, and vanadium redox (flow) batteries. In addition many novel experimental battery designs are under investigation that rely on advanced materials like copper antimonide nanowires, tin oxide nanocrystals, vanadium dioxide ribbons paired with graphene, and carbon nanotubes. When engineering battery materials to achieve targeted responses, processing methods directly impact performance. Optimizing the chemical and physical composition of starting materials influences characteristics like porosity and tortuosity of cathode microstructures that can offer higher energy density and limit factors like dendrite growth and SEI that ultimately contribute to battery failure. American Elements manufactures an extensive portfolio of advanced anode, cathode, and electrolyte materials in high and ultra high purities with strict controls for particle size and distribution, surface area, and physical morphology to the specifications of our customers. American Elements engineers and researchers possess expertise in fields such as electrochemistry and thin film synthesis, allowing us to provide guidance in the selection of materials for custom electrode compositions and electrolyte formulations with the goals of reducing production costs in mind. We can produce materials in a variety of forms such as macro, micro-, and nanoscale powders and dispersions and a in wide range of compositions including metals, ceramics, mixed-metal oxides, graphitic carbon, and chemical compounds for precursors, coatings, conductive additives, and active materials. Additionally, we supply materials for the fabrication of components at all stages of battery design including copper and aluminum foils for current collectors, metal foils, wires, and strips for cell housings, connectors, and chargers, and semiconductor crystals for integrated circuits of ancillary electronics such as on-board power supply and battery management systems. Health and safety concerns for battery use vary depending on the materials and mechanisms of operations. Heat generated is an issue for all types of batteries, given the electrical contacts and wires that connect to circuits. Overheating can cause ignition of some organic solvents used to create ionic liquids. Overcharging or subjecting certain batteries to a high load volume can cause the internal components to degrade, or in the case of lead-acid batteries, to produce excess hydrogen and oxygen that will explode. Another main concern for manufacturers is the toxicity of materials, especially the environmental impact from the improper disposal of used batteries. This is the main reason that nickel-cadmium batteries are being phased out of general use; a major goal for advancing battery technology must be to design high powered sources of energy that are both environmentally friendly and improve safety. The prime aim of recent R&D efforts has been to address the safety concerns of lithium-ion batteries, seeking solutions such as non-toxic and non-flammable electrolyte formulations and protection against overcharge and overdischarge.